was in here on a sun a,noon.and was mobbed.was bit scarey at first as full of big loud lads.but was great atmosphere and we stayed for a while.couldnt belive the triple spirit prices wouldnt be allowed in glasgow lol.def worth o look though. Dont expect young trendy people in here. It is an old fashioined pub full of the old regular punters, gets a bit boisterous, but fabulous for post footie match drinking. Really cheap and good atmosphere. Always busy no matter what time of day. Dont mind the odd pint in the Beehive for a change now and again. 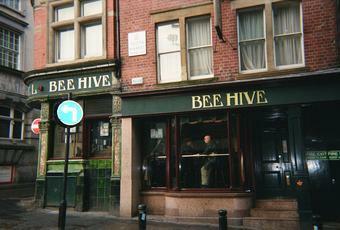 Proper geordie bar which will never change.